The Tampa Bay Lightning are playing coy about who's starting in goal for Game 3 of the Stanley Cup final. Ben Bishop took part in the morning skate at United Center and left the ice first, but neither Bishop nor coach Jon Cooper would reveal the plan for facing the Chicago Blackhawks. Ben Bishop apologized as he stepped away from the microphone. Seconds earlier he said he felt like Marshawn Lynch for repeating the same answers. 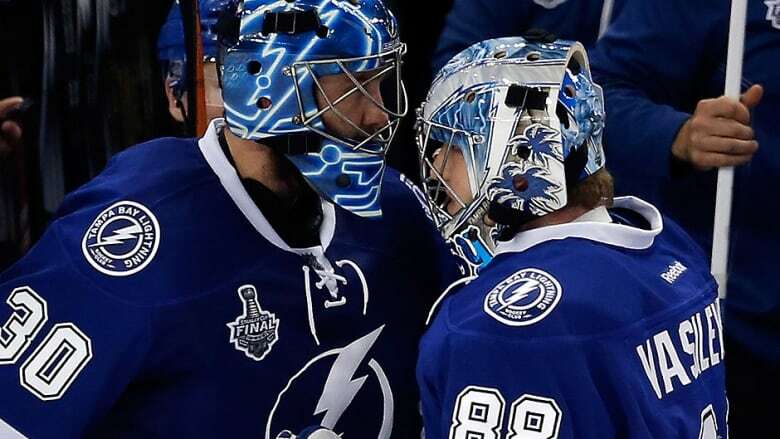 The Tampa Bay Lightning goaltender didn't say anything about what forced him to leave Game 2 of the Stanley Cup final against the Chicago Blackhawks or how he was feeling. Bishop's action of leaving the ice at practice first, as the starter typically does, was his most emphatic statement. Welcome to the intrigue of the final for the Lightning, who want to keep everyone guessing whether Bishop or rookie Andrei Vasilevskiy is starting Game 3 Monday night. "One of them is playing. It's Vasi or Bish," coach Jon Cooper said. "We have two capable goalies that we have 100 per cent confidence in." That's a world of difference from last year's playoffs, when Bishop's elbow injury make him unavailable to face the Montreal Canadiens. Cooper had little recourse but to turn to Anders Lindback, whose .881 save percentage led to a Kristers Gudlevskis appearance, but not until it was too late. Cooper didn't blame Lindback for getting swept in the first round. "I truly believe if we had Ben Bishop in goal last year, I'm still not sure we win that series," he said. "I will never sit here and say last year we lost because of our goaltending. We lost as a team." This season, Cooper said the Lightning have the luxury of Vasilevskiy being a "1A goaltender." "He's going to be a star in this league one day," Cooper said. Vasilevskiy is one of the top goaltending prospects in hockey at the age of 20. He has world junior and KHL experience and also made 13 NHL starts this season. While Bishop is the present for the Lightning in goal, Vasilevskiy looks like the future. Each appearance is a building block. Cooper pointed to a 45-save performance at the New York Islanders as a shining example of the young Russian's potential. "He was unreal. He just played with this unreal calm about himself. That's kind of when I knew we had something in this kid." On the Blackhawks' side, there will be lineup changes and less mystery. Forward Bryan Bickell appeared ready to return after a bout with vertigo and defenceman Trevor van Riemsdyk looked to be in for his first NHL action since November. Officially, coach Joel Quenneville said Bickell and van Riemsdyk "could play," but had a big grin on his face. The ever-smiling van Riemsdyk was glad to be healthy enough to make his Stanley Cup playoff debut. "I've definitely come a long way since called back up," van Riemsdyk said. "Just being out there on the ice, just going through everything, it's helped a lot. I feel way better than I did when I first got here after the wrist injury."